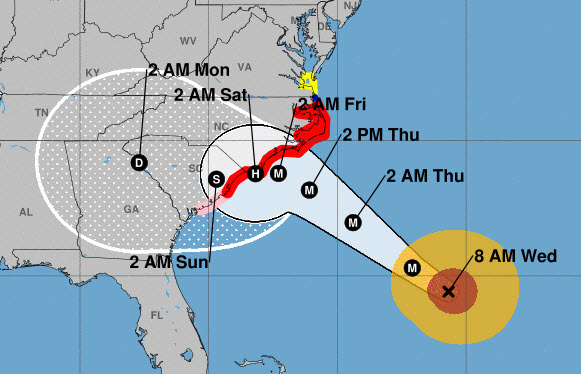 RICHMOND, Va. — The track of Hurricane Florence drifted southward again overnight into Wednesday morning. Although the storm will still bring rain to Central Virginia, the chance for widespread flooding in our area has decreased significantly. Hurricane Florence’s greatest impact will still be along the coasts of both North and South Carolina late Thursday night through Saturday. Hurricane Florence remains a category 4 hurricane, and continues to head towards the North Carolina coast. Please note that this can still change, but these news can give us some relief that Florence is not coming directly our way and we’ll most likely experience tropical storm conditions. So you saying Florence is soft?